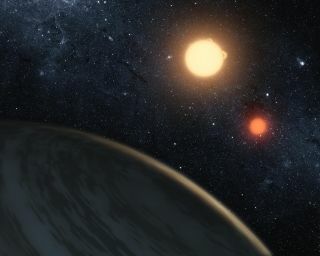 An artist's illustration of Kepler-16b, the first planet known to definitively orbit two stars. More planets orbiting two stars have been found since Kepler-16b’s discovery. KISSIMMEE, Fla. — A new technique could allow scientists to photograph potentially life-supporting planets in nearby multistar systems, its developers say. The most straightforward way to learn about alien planets is to look at them directly with a telescope, rather than relying on indirect methods such as noticing their effects on the stars they circle. Most systems featuring sunlike stars "are actually multi[-star systems]," Ruslan Belikov, an astronomer at NASA's Ames Research Center in California, said during a session at the 227th meeting of the American Astronomical Society here Wednesday (Jan. 7). "A telescope that is only imaging single-star systems will generally miss these." "Alpha Centauri, which is the closest star to us, would be by far the best target [for direct imaging] … if it wasn't binary," he added. Because of Alpha Centauri's proximity to Earth (about 4.3 light-years), researchers could use a relatively small space telescope to get a close look. But Belikov, NASA Ames researcher Eduardo Bendek and colleagues have come up with a possible solution for this problem. Scientists hoping to directly image an exoplanet use special tools on or in front of a telescope to block out a star's light, and they can also use optical techniques through a telescope's mirrors or processing after the image is collected to cancel out extra noise and interference. The research group figured out how to deform mirrors enough to blot out the disruptive effects of two stars at once, beyond the usual limit of how much interference a mirror can correct for. This and other modifications could theoretically allow astronomers to image planets in binary systems such as Alpha Centauri, Belikov said. Going beyond the deformable mirror's usual limit relies on a faint grating pattern introduced on many mirrors as a byproduct of the manufacturing process — something that can lead to tiny distortions often seen as a bug of such mirrors rather than a feature. "We as scientists delight in disproving conventional wisdom in such things, but in this case it's especially so," Belikov said. "The reason we can do this impossible thing is because of something that is generally considered to be a deficiency." The newly proposed set of techniques can be applied to telescopes without complex hardware modifications, Belikov said. Finding a way to look at multiple-star systems like Alpha Centauri using a similar process could lead to glimpses of interesting alien planets — in Alpha Centauri's case, with a much smaller telescope than previously thought possible. But Belikov's AAS talk had another takeaway message as well. "The most important conclusion of all is to have zero respect for authority telling you that something is impossible," he said. "Unless it's a law of physics."